A recent report published by Infinium Global Research on industrial gaskets market provides in-depth analysis of segments and sub-segments in the global as well as regional industrial gaskets market. 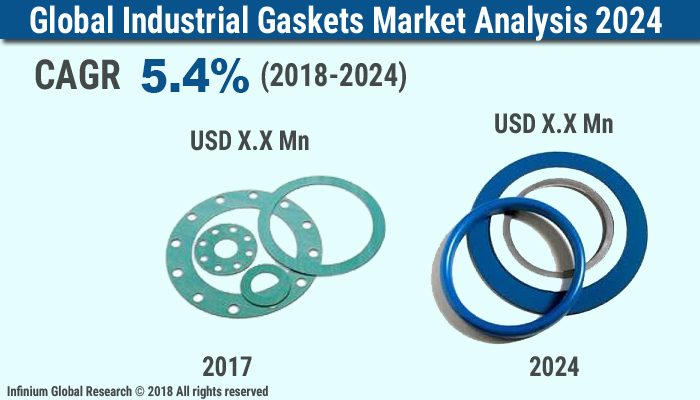 The study also highlights the impact of drivers, restraints, and macro indicators on the global and regional industrial gaskets market over the short term as well as long term. The report is a comprehensive presentation of trends, forecast and dollar values of global industrial gaskets market. According to the report, the global industrial gaskets market is projected to grow at a CAGR of 5.3% over the forecast period of 2018-2024. Gaskets are primarily used to fill empty spaces between the coupling surfaces to avoid leakage and wastage of fluids and gases. Gaskets are usually produced by cutting sheet materials. Most industrial gasket involve bolts exerting compression well into the 14 MPa (2000 psi) range or higher. Silicone and rubber are the most preferred material used for manufacturing gaskets due to their superior characteristics including high reliability, better strength, high flexibility, and resistance to high heat and pressure. Increasing demand from oil and gas production related facilities in the Gulf countries drives the growth of the industrial gaskets market. In addition, increasing consumption of Polytetrafluoroethylene gaskets and stringent leakage regulations implemented by environmental protection agency to prevent damage to the environment are strengthening the growth of the market. With the increase in industrial development and urbanization, there has been a considerable rise in the number of manufacturing plants, machineries, automobiles, and various other mechanical instruments which use a gasket. This has had a positive impact on market growth. In automobiles, gaskets are widely used for propelling to avoid leakage or wastage of expensive fluids or gas. Due to their property to sustain extreme pressure conditions, compressive loads, and heat, gasket have noteworthy scope across different industry verticals. However, price volatility of raw materials such as rubber, silicone, graphite and so on are curtaining the growth of the industrial gaskets market. Furthermore, the increasing number of refineries in the Asia Pacific region is further anticipated to create several growth opportunities fir the key players in the global gaskets market. Among the geographies, North America dominated the global industrial gaskets market. The growth in the North American region is due to demand from the oil & gas, chemical, and pulp and paper industries. The mounting demand for industrial gaskets from the refineries, power generation, and chemical processing sectors are expected to fuel the growth of North America. The report on global industrial gaskets market covers segments such as product type and end-user. On the basis of product type, the sub-markets include ring joint gaskets, kammprofile gaskets, spiral wound gaskets, soft gaskets, jacketed gaskets, corrugated gaskets, and other gaskets. On the basis of end-user, the sub-markets include power generation, industrial machinery, chemical processing, refineries, pulp & paper, food & pharmaceuticals, and others. The report provides profiles of the companies in the market such as Flexitallic, W. L. Gore & Associates, Inc., Klinger Limited., Garlock Sealing Technologies, Lamons, Hennig Gasket & Seals Inc., James Walker, Spira Power, Donit Tesnit D.O.O, Henning Gasket & Seals Inc, and Teadit. The report provides deep insights into the demand forecasts, market trends, and micro and macro indicators. In addition, this report provides insights into the factors that are driving and restraining the growth in this market. Moreover, The IGR-Growth Matrix analysis given in the report brings an insight into the investment areas that existing or new market players can consider. The report provides insights into the market using analytical tools such as Porter's five forces analysis and DRO analysis of industrial gaskets market. Moreover, the study highlights current market trends and provides forecast from 2018-2024. We also have highlighted future trends in the market that will affect the demand during the forecast period. Moreover, the competitive analysis given in each regional market brings an insight into the market share of the leading players.